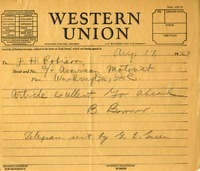 Tracy W. Byers telegrams Martha Berry to inform her that she will be arriving in Rome on a Wednesday night. 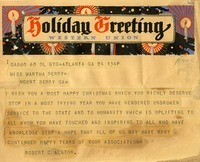 Mr. Alston sends a telegram to Miss Berry wishing her a merry Christmas and admiring her steadfastness during a very trying year. 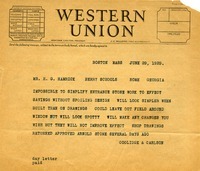 Mr. Alderman regretfully informs Miss Berry that he will not be able to assist her. 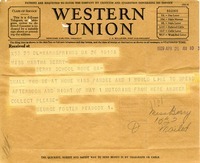 Telegram to Martha Berry from George Foster Peabody asking if he and Miss Pardee can stay with her on May 1. 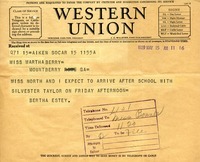 Ms. Estey says she expects to arrive Friday afternoon with Miss North and Silvester Taylor. 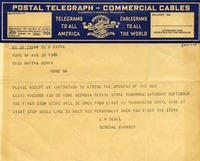 Letter to Martha Berry from G. Lister Carlisle Jr.
A telegram from G. Lister Carlisle Jr. that brings news of Edgar Seeler's (Carlisle's brother in law) death. 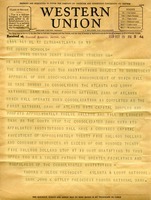 The Berry Schools respond with the news that Martha Berry is abroad and extend their sympathies. 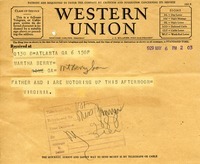 Virginia tells Miss Berry she and her father are heading up this afternoon. 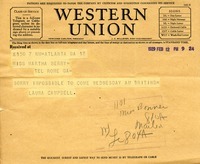 Laura Campbell wires Martha Berry to inform her that she will be unable to visit. 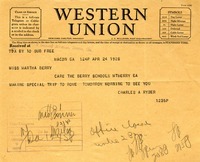 Ms. Tyle asks for the exact date Miss Berry will be coming up and also asks if she will be coming from New York or Boston. 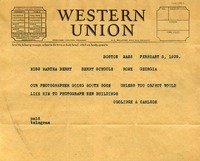 Ryder informs Miss Berry that he will be making a special trip to Rome the next morning to see her.